Giant Axe, the home of Lancaster City F.C. (Lancaster City F.C). Two goals from Lancaster forward Aaron Taylor helped the Dolly Blues to a convincing 3-1 win over Greater Manchester outfit Radcliffe Borough. The match got off to a bright start with Lancaster taking the lead two minutes in – Taylor getting his first goal of the afternoon following a neat headed effort. However, Lancaster were pegged back almost immediately with Radcliffe Borough’s first meaningful attack. Just five minutes into the match a goalmouth scramble ensued, with the ball finally making it into the back of the Lancaster net – the unfortunate last touch coming from Lancaster defender Ben Hudson. The goal for Radcliffe didn’t really appear to give them any motivation, with Lancaster having the better play throughout the first half. Taylor in particular was looking lively, and somehow failed to double his tally on the eleven minute mark after firing a free header over the crossbar. Moments after this miss there was one even more spectacular: Winder bombed into the penalty area and played a dangerous ball into the six-yard box only for a Lancaster attacker to fall over his own feet rather than slot the ball into the back of the net. 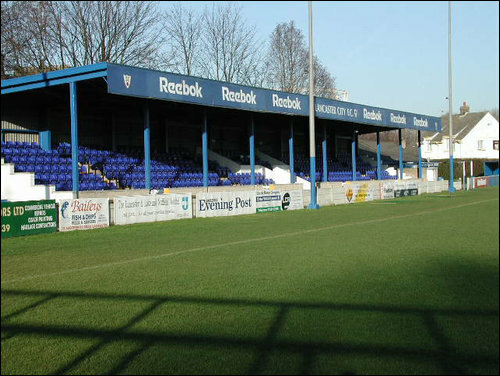 Owing to Lancaster’s dominance across the park, Radcliffe were being forced to shoot from distance throughout the early stages, with Radcliffe midfielder Lambert in particular having a number of speculative efforts from 30 yards out. Another chance for Lancaster to increase their lead occurred at the 23 minute mark – Lancaster’s joint top scorer Tom Kilifin smashed the ball into the side netting when he should have done better. The shot did not lack power, however. The match had to be held up whilst goal netting was re-secured. The game then settled down and became entrenched in the midfield. The constant turnover of possession slowed the game down and limited efforts on goal. The third goal of the afternoon came just five minutes before half time: Kilifin showed good composure after being set up by the captain, Marshall, slotting home his seventh league goal of the campaign to put Lancaster back in the lead as the teams went in for half-time. Some harsh words from the Radcliffe Borough manager seemed to inspire the side as they came out of the club house looking much the sharper side when second half kicked off. Despite creating chances, though, they could not finish them; Radcliffe’s Sam Howell had a particularly poor effort when positioned well. After being kept quiet most of the first half, Grimshaw for Radcliffe looked like a man with a point to prove – he spent the early parts of the second half creating chances and controlling the midfield. Grimshaw also found himself on the end of the best chance of the second half thus far – in acres of space on the right wing he hit the ball just wide of the target. Grimshaw was at it again just a few minutes later with an almost identical chance to his last one which, fortunately for Lancaster, had an identical result. After failing to capitalise on those chances, Radcliffe found themselves under some pressure, with Lancaster creating some great chances but failing to take them. Lancaster’s persistence, however, paid off on the 81st minute. Taylor doubled his tally for the afternoon with a cross-come-shot finding its way into the back of the net, much to his surprise. Moments later Kilifin had the chance to well and truly put the game to bed, but lost possession in the Radcliffe penalty area and the ball was cleared. Radcliffe were now piling men forward in an attempt to salvage something out of the game. However, Lancaster held firm to see out the game to earn their fifth league win of the season. Next articleShould university tuition be free?